Oooh, welcome back my dearest English speaking-thinking-reading visitor, welcome to the second part of the post “How to use the hologram of a white rhino called <<Slim Tim>> to cook spaghetti, wash your conscience and put up a bolero dance act in the middle of the dining room of the President of the Guatemalan branch of <<The Authority For The Perfect Fonduta>> while he/she’s having a private conversation with his/her lawyer about the lawsuit filed for misleading advertising against the city of Cheeseville (43°28′08″N 88°04′50″W”)"… Ooops, nope, sorry, eheh, just confused the posts, this one‘s still under scrutiny of the “Commission of Weary Neurons and Short Sleeve Shirts with Ties” to get the “go” for publication. Ok, then, let’s start again. Oooooh, welcome back etc. to the second part of the post which tells the story of a student, a doctor and a professor (Mr. Sender, Dr. Fuchs & Prof. Milo aka the SFMs) who don’t enter a bar but instead show how the commonly accepted notion that, in the ecosystem the human body is, bacteria outnumber human cells by 10 to 1 (in an adult, healthy, 20-30 years old, 1.70m tall, 70kg* heavy reference man (1) here friendly called Mr. Ref) is not true. The SFMs first collect evidence –as the Part1 of this post reports- that the number of bugs in&on human bodies is not, as estimated till now, in the order of 1014, but rather of a factor of 10 smaller. It is, indeed, 3.9x1013. The three happy researchers then proceed to update the second number that is used for the 10 to 1 ratio (the first one being that of the bacteria): the number of the actual human cells in the human body. And what follows is the tale of how they do that. The SFMs once again start checking the scientific literature. They find that, in papers from 1985 to 2013, the amount of the human cells is reported as ranging between 1012 and 1014. Our curious scientists, in their study, mention only three different kind of approaches followed in the years by their colleagues to calculate how many little bricks make the human building. The first approach switches from the fit 70kg Mr. Ref to a bigger 100kg man, and then divides the mass of this hulk by the 10-12 - 10-11kg mass (“assuming cell volumes of 1,000-10,000 µm3, respectively” Sender et al, 2016; (P)) of what is considered to be the “representative” (P) mammalian cell. This method clearly doesn’t consider that human body’s mass is also made by extracellular stuff, besides the cells themselves. Anyway it is a clear and rather concise way to get to a final result: human cells are between 1013 and 1014. The second approach is based on DNA. 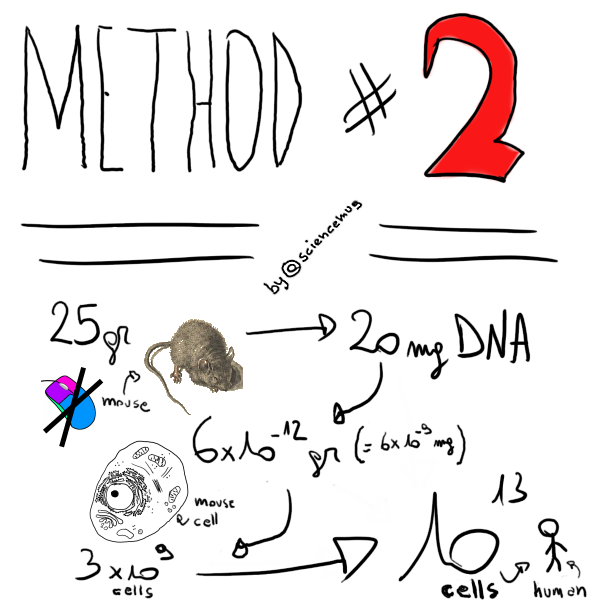 It starts valuating the number of cells in a mouse. No, its name is not Mickey. No, it does not show its compulsive germ phobia by always wearing a pair of white gloves. And no, its best friend is not a talking biped dog with wide spaced beaver front teeth which for some inexplicable reason has evolved while the other dog of the situation just barks, wags its tail, walks on all fours and probably farts regardless of anything and anybody. The mouse here is a 25gr thing, with 20mg of DNA in it (the Mickey guy instead has tons of DNA, but that’s Disney Narrative Appeal, not DeoxyriboNucleic Acid). This total gloveless mouse body amount of DNA is divided by that of a single diploid gloveless mouse cell (namely 6x10-12g) to get a total of about 3x109 cells forming the above mentioned gloveless mouse body. This second method, then, makes a proportion between a Mr. Ref’s mass and the tiny mouse mass, and, like that, calculates that the 3x109 cells of the gloveless mouse correspond to about 1013 cells in a human body. The third approach to calculate the totality of human cells in a human being that the SFMs mention is the one used by Bianconi et al in 2013 [(2); oh, visitor, try to remember this name ‘cause I’ll mention it again and again in this post since the SFMs often use the Bianconis’ research as a reference source of data to compare their own data to. Ok, let’s help you out on this: let’s make that every time I’ll recall the Bianconis’ study I also contextually write the symbol “§”, that is not logically linked in whatsoever way to the issue, but it’s strange and complicated and unique and mysterious, so it should stick to your mind. So “§” - besides possibly being one of the five symbols (the other four are up to you to be found) that switch on, via hypnotic suggestion, some dormant cell of spies from Planet X that has the order to cut every single bottle of whisky on Earth with 9.576ml of juice of squeezed algae of the Sargasso Sea so to slightly alter and worst the whisky taste, depress the by this confused and disconcerted whisky purists, weaken their will, and start from them to create a fifth column which will help to eventually fulfill Planet X prime directive: to globally destabilize human civilization by stealing every single stamp on Earth which portray the Elvis (the first Planet X undercover agent ever who’s now collecting funds to sustain his 2018 “Khan of Planet X” campaign) - will be there to remind you of the Bianconis’ paper]. an overall of 3.72x1013 human cells in your Homo sapiens body (for a detailed, but given the entity which writes it quite boring, report on the Bianconis’ quest scroll down till you reach William Will Whatever’s spot. I know, I know, but our legal url says that we must let WWW do it or we risk to be suited for discrimination on the basis of “a higher QI” (WWW’s one)... QI… I don’t even know what a Questionable Id is… Bah!). So, after plumbing the literature and focusing on the three methods just described, the SFMs decide to revisit the data and, well, basically do it better. Our science trio opts to check the six cell types that alone are generally thought –by science- to make the 97% of all human cells: “red blood cells [RBCs; aka erithrocytes] ([…]70%), glial cells [GC] (8%), endothelial cells [EC] (7%), dermal fibroblasts [DF] (5%), platelets (4%) and bone marrow cells (2%).”(P_Rx). As mentioned above in this post, the SFMs compare their brand new numbers to those of the Bianconi § et al study. As for the RBCs, the Sender’s pack says that you humans have an average of 4.9liters of blood in you (and of this leaches, mosquitoes, ticks, ex-wives/husbands, lawyers, the IRS et similia, more or less ridiculous/funny/horrific/prone-to-be-easy-preys of-a-blond-teenager-slayer-with-clear-father’s-issues vampires aaand the blood banks worldwide are very very, very grateful). Moreover, the mean number of RBCs per liter of your blood is 5.0·1012, given science literature data and also simply given the blood analysis everybody more or less routinely does which say that “normal values [for RBCs] range from 4.6-6.1x1012 cells/L for males and 4.2-5.4x1012 cells/L for females” (P_Rx). So, the SFMs do the math and come up with a total of 2.5x 1013 red blood cells that run in your human veins and arteries (Bianconi’s § bunch says 2.6x1013). Senders and colleagues pass then to glia cells, which are those handy little brainy things that hold together and feed those other useful brainy things of yours called neurons. The SFMs once again here don’t buy what most of the science studies states about glia cells, that is that a 10:1 ratio exists -ooooh, look at this, look. At. This: another 10 to1 ratio pops up, a coincidence? Maybe, or maybe it’s a conspiracy or something of the Trust Of the Fairies and Spirits of the Elementary Forces and High School Musical Obsessed Energies and the Union of Sorcerers for a 10:1 Bacon slices vs Tofu pieces on the Dishes of the Tables of the Under&Upper&Aside(r)Worlds- between glia cells and neurons. Our three scientific paladins of the revised data put in fact their trust on a 2009 study by Azevedo et al that analyzes “the variation in between brain regions [and] concludes that the ratio[,instead,] is close to 1:1 [concluding] that there are 8.5·1010 glial cells […] in the brain” (P_Rx) (According to Bianconi et al glia cells are 300x1010). The SFMs go on with the third group of cells, the endothelial cells, which are those cells that cover the inner part of your human blood vessels (read veins, arteries and capillaries). Sanders&co use “mean diameters for different blood vessels to derive the total length of each type of vessel (arteries, veins, capillaries etc.) and its corresponding surface area. 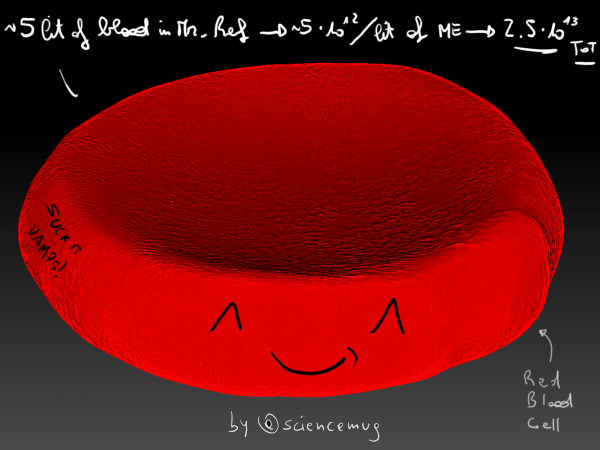 Dividing by the mean surface area of one endothelial cell […] [-as reported in literature- the SFMs] derive a total estimate of 6x1011 [endothelial ] cells [in Mr. Ref’s body]” (P_Rx) (Bianconi § et al number: 25x1011). Aaaas for the dermal fibroblast… Oh well, I’ll tell you this story after the break! Tired of all those human cells that need to be constantly nurtured and that make you feel so heavy and too structured? Wanna feel lighter and be finally free? Try “SweepCellsellin”, the new two steps program by “Human is boring Inc.”, the company that cares for your wallet and for the fate of the characters played by the extras in the background of the sit-coms. “SweepCellsellin” two step program first puts you into a tank full of piranhas fed only with soy bean sprouts and Teflon for one month and a half so that they gulp down relevant chunks of yourself in three quarters of a picosecond, and then replaces those missing chunks with hay and feathers of seriously underweight hummingbirds. Sign up for “SweepCellsellin”, and you’ll forget what the burden of having an actual coherent mass means! Ooooh, Senders and lab pals find that, in the past, the number of dermal fibroblasts [they make the connective tissue and the extracellular matrix (a soup of assorted extracellular molecules) which make the skin tightly adhere to the body and ensure the epidermis gets actually organized into proper tissue] is calculated by multiplying their areal density (i.e. their quantity per surface unit) by the total surface area (SA) of our mighty Mr. Ref’s body, which is 1.85 square meters (Herman, 2007; see P). The SFMs, instead, take into consideration also the thickness of your skin, dear human visitor. Again, they dig deep into the science literature and find a paper where dermal thickness is measured “at 17 points throughout the body […], with the mean of these measurements yielding 0.11±0.04cm.” (Moore et al., 2003; see P). Moreover, dear English-fond visitor with a skin thick and hunted by fibroblasts, moreover the Sender’s bunch and its bibliography says that “dermis is composed of two main layers: papillary dermis (about 10% of the dermis thickness) and reticular dermis (the other 90%)” (P) and that the at this point renowned fibroblasts are much more on the former than in the latter [as papillary dermis fibroblast density (σpap.) is 106 cells per cm2 while reticular dermis fibroblast density (σret.) is 0.3x106 cells per cm2 (P_Rx)]. 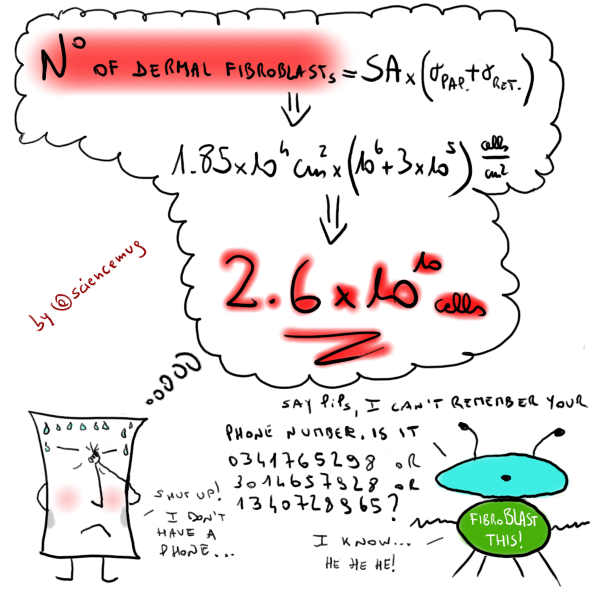 Sooo, the SFMs put together all these numbers [as you can see in the FIG1 gushing out of PiPs’ (empty) skull] and find that dermal fibroblast in Mr. Ref are “only”, if compared to the amount of red blood cells, 2.6x1010 (Bianconi § et al score is instead 185x1010). Our three smart science buddies finally update also the numbers of platelets and bone marrow cells, and the SFMs find that these kind of cells are respectively the 4.9% and 2.5% of the whole human cellular community. At this point, after all these estimations, let’s recap, dear visitor. Senders and colleagues check the actual numbers of the six cell types that science community considers the ones making the 97% of the human body: red blood cells, platelets, bone marrow cells, glia cells, endothelial cells, dermal fibroblasts. The Canadian-Israeli lab guys sensibly cut the numbers of the last three cell types. 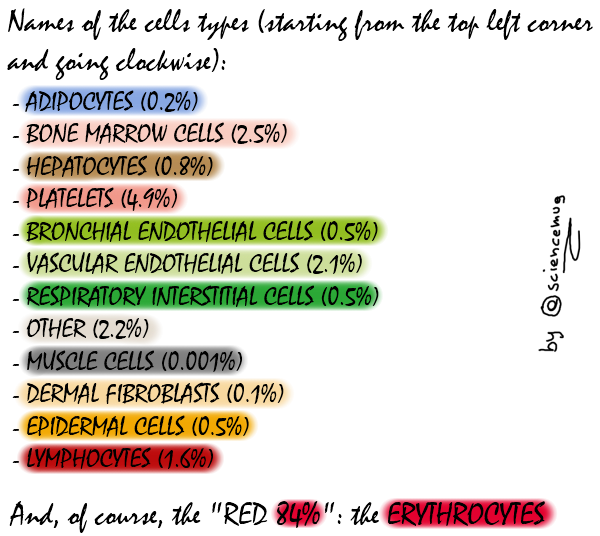 Above all, the SFMs confirm that red blood cells-erithrocytes are by far the most numerically relevant of these six cell types. More in detail, the researchers calculate that RBCs are the 84% of all the human cells and that their total amount is a staggering 2.5x1013. Finally, the SFMs put together all their new updated data and the reliable data of all the remaining cell types and get that the total amount of human cells in the human body is about 3x1013. And also what is displayed in FIG2 and FIG2a. As you can see, dear visitor “over the 90% of human cells originate from the hematopoietic stem cell” [i.e. the cells from which red blood cells (84%)+platelets (4.9%)+lymphocytes (1.6%) and all the rest of the blood bunch originates] (P). But now I can feel your perplexity expressing itself in a sentence that sounds more or less like this: “WHAAAAT? Those red blood cells and the other blood stuff, they’re tiny tiny tiny things, how can they make over the 90% of me, I mean, I thought I were all muscles and fat! You can’t gym or diet the blood!”. Weeeeell, dear visitor, listen to this. Your human Body Weight is this: Fat + Extra-Cellular Solids (ECS) + Extra-Cellular Fluids (ECF) + Body Cellular Mass (BCM) (3). 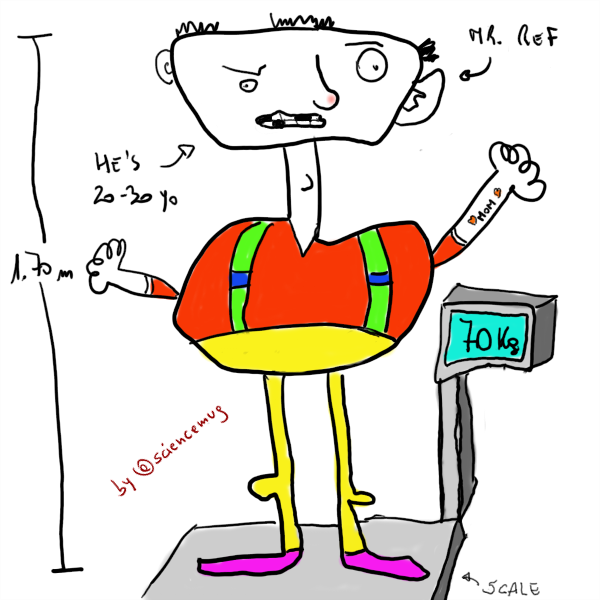 The science brains know that Mr. “70kg heavy” Ref is made for the 7% of ECS and for the 25% of ECF (3). Therefore what remains is a bag of about 47kg of BCM and fat. The science brains also know that potassium (K) levels in the intracellular (K-int) and extracellular (K-ext) spaces of humans’ bodies are quite constant. Besides they also also know that K is mostly stuffed inside the cells, while outside the cells, in the extra-cellular reality, well, K’s concentration is just a tiny 3% of the intra-cellular one. So, well, K-ext can be happily dumped-&-forgotten and the science brains can take only K-int into consideration for their science brainy calculations (4). Theeee science brains, finally, have a mighty formula [Body Cellular Mass (kg)=0.0092x K-concentration (millimoles)] by which they are able to derive the BCM in each human body tissue from known potassium (intra-cellular) concentrations in it: (4). 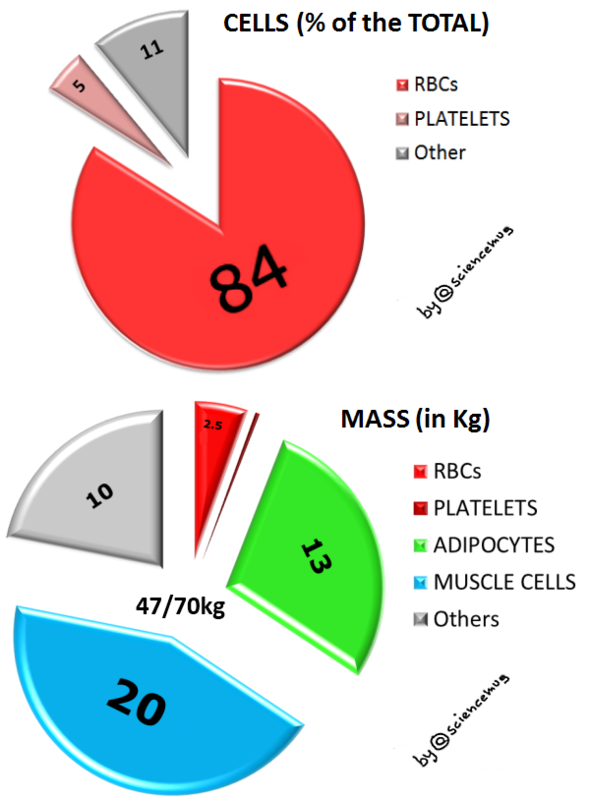 So, to sum up, Senders and colleagues have, now, all the information needed to calculate what is the contribution to the 47kg (out of 70kg of Mr. Ref) body mass of each cell type. Or, in other words, the SFMs know the “[d]istribution of cell number and mass for different cell types in [Mr. Ref’s] body” (P_Rx). Aaand this is what it is (FIG3). So, dear visitor, coming back to your question now. The naked truth is that, yes, the blood cells are a freaking multitude, but they’re veeeery small (with a volume of about 100 µm3 –10-7cm3-(P_Rx)), so they don’t make much of your body. On the other hand, fat and muscle cells are just a fistful, but they’re pretty huge guys (with volumes usually bigger than 10000 µm3 -10-5cm3-) so they are the main characters in the “The makers of the 75% (P_Rx) of the total cell mass of the human body” (full of “of”) movie. Sooooo, happy owner of a real body visitor [unless you’re a sentient bot, an AI, a cyborg, a ghost or a clump of subatomic quantic fluctuations that by chance can understand what I’m writing (by the way, if so, well, congratulations pal, I doubt I could do it myself…)], let’s go with a general recap. The Senders’ want to verify whether it be actually true the commonly accepted idea that, in the human body, bacteria outnumber human cells by 10:1. So Senders and companions of science first (see Part1 of this post) investigate the number of bacteria living in/on Mr. Ref. They discover that this number is a factor of 10 smaller than the previous estimates, and that it can be approximated to the number of the bugs living in the human colon, meaning 3.9x1013 (P). Then, the SFMs focus on the number of actual human cells in the human body. 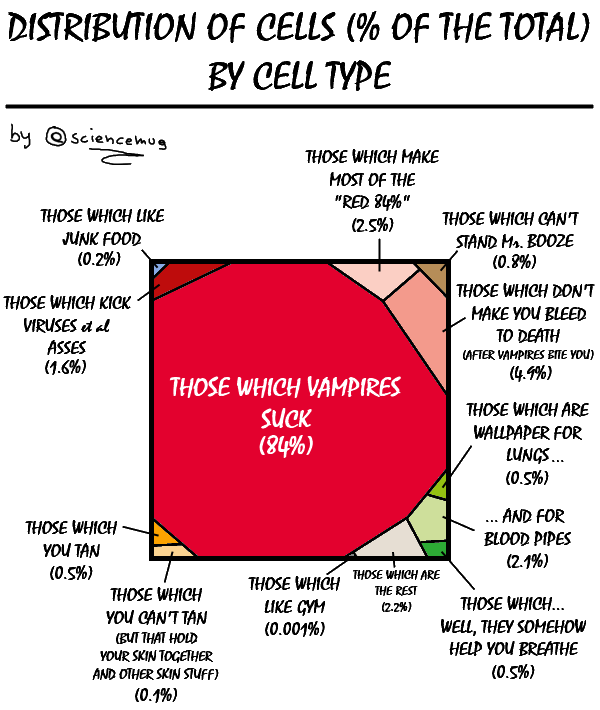 They update many former values and find that the smashing majority (84%) of the human cells are Red Blood Cells, and these cells are 2.5x1013 (P). So they decide to use this number to calculate a reliable approximation of the totality of the human cells in the human body: 3x1013. Soooo, dear visitor, during a sumptuous ceremony on TV worldwide, surrounded by an immense crowd of hysterically screaming science-groupies in awe, the SFMs, dodging bras flowers and thongs, finally recalculate the bacteria:human-cells ratio. It is no more 10:1. It is a much more equilibrated 1:1! The bugs vs human cells ratio is so in balance indeed, that every time you, dear human visitor, go number two, well, “[you] excretes about 1/3 of [your] colonic bacterial content, [and this] may flip the ratio to favor human cells over bacteria” (P) (not to mention what happens when you human being go through the joyful preparation for that funny procedure that’s the colonoscopy…). Isn’t that’s something! A-aaah, so the job is done! Eventually, it is don…e… What, visitor? WilliamWill Whatever suggests you to ask me the “Ok, the ratio is 1:1 in dear 1.70cm high-70kg heavy Mr. Ref, but what about the non-Mr. Refs all around the world, like, I dunno, women, overweight people, newborns?” question?! Damn! I’ve to admit you and WWW have a point there! Well, pal, the answer to this and other questions about the Sender et al paper (like… “WHY?! Why three brilliant scientific minds invest so much time in understanding what’s the actual bacteria:human-cells ratio in the human body rather than trying to crack much more compelling enigmas like, let’s say <<would donuts be still delicious if they weren’t round shaped?>> or <<what kind of biological instinct pushes a XY human exemplar to purchase+wear micro monokinis?>>?”) will come soon in the third and final part of this (never ending) post! Till then, ciao (and remember to go shop me and/or fund me, if you feel like and if you spare some money)! Dear Visitor, as mentioned before by this dull blog, I have obtained the legal right to bring some real substance to this otherwise inane post. I am not wasting Your time describing You the whole excellent Bianconi et al, 2013 paper (2). I would like to just highlight a part of it, the one in which Bianconi and colleagues show why they decide to systematically check the different cell types. The researchers first estimate the total number of human cells “by dividing the mass or volume of a reference adult human body by the mass or volume, respectively, of an average human cell”(2), and they use data from science literature to do that. For example, the mean weight of a mammalian cell is 1nanogram, that is one billionth of a gram (10-9grams, or 10-12kg). So if one divides 70kg (total cell mass of the reference man) for 10-12kg (single cell mass) one gets that the total number of cells is 7x1013. But if one, instead, considers the mean volume of a mammalian cell, things change. The mean volume of the single mammalian cell is 4x10-9cm3. The volume of a human body, instead, is averaged to 65.22liters (i.e. 65.22x103cm3) by some studies. So the number of cells is 1.63x1013. But, according to other researches, the human body volume is 60liters. So, if one uses this volume as a reference, then the total cells number becomes 1.50x1013. If one, though, wants to employ, as a reference volume for the single human cell, that of the red blood cells (since these cells are the most numerous of the human body) the result changes again. And sensibly. The volume of a RBC is 90 femtoliter (90fL; 1 femtoliter is 10-15 liters, or 10-18cm3) thus, by this meter, the total number of cells is 7.24x1014 (considering a 65.22x103cm3 body). 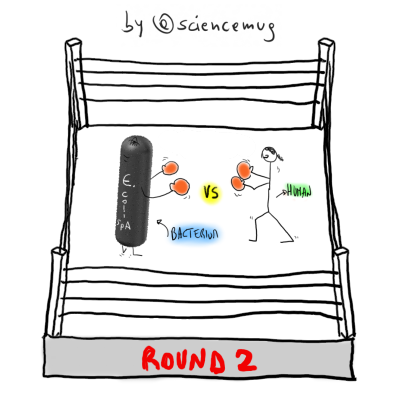 On the other hand, if one chooses another cell type, like endothelial cells, the result changes once again. The volume of an endothelial cell is 6x10-9cm3. The amount of endothelial cells is calculated to be 35x1012. These endothelial cells alone, then, would result in a body volume of 21x104 cm3, that is 210liters, that is about three times the volume of the reference man. To sum up, this approach leads to multiple values for the total cell numbers: 7x1013, 1.63x1013, 1.50x1013 up to a factor of 10 higher 7.24x1014. That’s a pretty wide range of results, not to mention the absurdity of a human body with a volume of 210liters. So, dear visitor, You can see for Yourself that the “estimation of the human total cell number by mass and by volume“ gives results that are very different from one another (up to a factor of 10) “due to the high variability in cell size, volume and weight among different cell types and, in turn, due to high variability in cellularity for each cell type in the human organism” (2). As a consequence, then –and I conclude- Bianconi and colleagues go with their new strategy and decide that “[t]he most reliable way to determine the human number of cells […] be to sum the cell counts for individual organs” (2). Oh, and, with their method, they calculate that human cells are 3.72 x1013, by the way. Another interesting thing that this impeccably dumb blog has forgotten to highlight is this: Red Blood Cells and platelets have no nucleus, hence no nuclear DNA in them. So, about the 90% of human cells are (nuclear) DNA free. 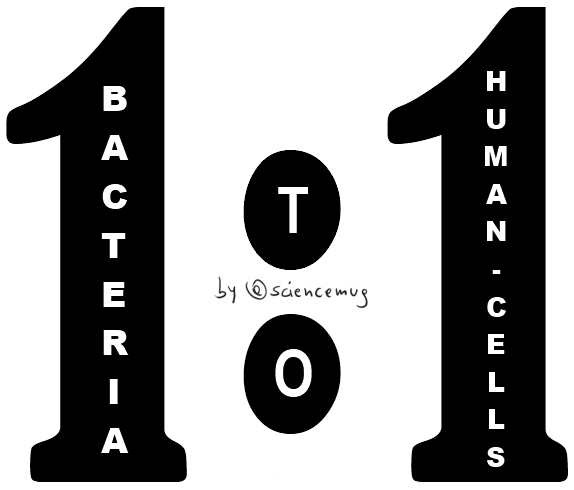 Then, if one compares the number of bacteria in/on the human body (~3x1013) with the number of human cells with (nuclear) DNA in the human body (10% of ~3x1013= ~0.3x1013), well, dear Visitor, one gets a ratio of -guess what- 10:1. Again. Just for You to think about it. 2- Bianconi, E., Piovesan, A., Facchin, F., Beraudi, A., Casadei, R., Frabetti, F., Vitale, L., Pelleri, M. C., Tassani, S., Piva, F., et al. (2013). An estimation of the number of cells in the human body. Ann Hum Biol 40, 463-471. 3- Shen, W., St-Onge, M. P., Pietrobelli, A., Wang, J., Wang, Z., Heshka, S., and Heymsfield, S. B. (2005). Four-compartment cellular level body composition model: comparison of two approaches. Obes Res 13, 58-65. 4- Wang, Z., St-Onge, M. P., Lecumberri, B., Pi-Sunyer, F. X., Heshka, S., Wang, J., Kotler, D. P., Gallagher, D., Wielopolski, L., Pierson, R. N., Jr., and Heymsfield, S. B. (2004). Body cell mass: model development and validation at the cellular level of body composition. Am J Physiol Endocrinol Metab 286, E123-128.